Fluid properties for methane are mainly calculated using the Setzmann and Wagner equation of state (Setzmann and Wagner, 1991). This formulation uses density and temperature as the primary variables with which to calculate properties such as density, enthalpy and internal energy. When used with the pressure and temperature interface, which is the case in the Porous Flow module, methane properties are typically calculated by first calculating density iteratively for a given pressure and temperature. This density is then used to calculate the other properties, such as internal energy, directly. The computational expense associated with the iterative calculation can be mitigated using TabulatedFluidProperties. 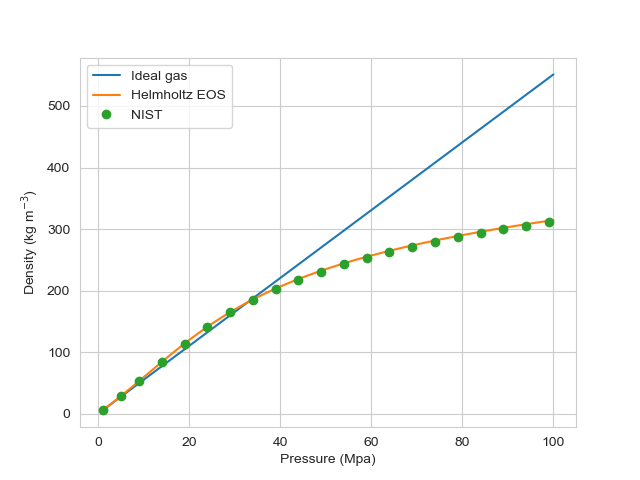 For low pressures (typically less than 10 MPa), the properties of methane can be approximated using an ideal gas, which are much faster to calculate. However, at higher pressures, this approximation can lead to large differences, see Figure 1. Figure 1: Methane density at 350K for various pressures. Transport properties such as viscosity and thermal conductivity are calculated using the formulations provided in Irvine Jr and Liley (1984). Dissolution of methane into water is calculated using Henry's law (IAPWS, 2004). and pressures up to 100 MPa.